A dangerous swelling on an artery, liable to burst. The common sites for aneurysm formation are on the aorta — the largest artery in the body — and on the small arteries under the base of the brain that supply the blood to it. The former are usually caused by atherosclerosis, the latter by a congenital weakness of the vessel wall. 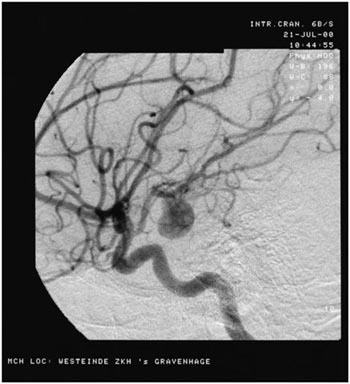 Angiograph of an aneurysm in a cerebral artery.